Remember the delightful little Toucan from Brendan Fraser’s George of the Jungle. If you do remember the chirpy little bird then you will love 1 can, 2 can. 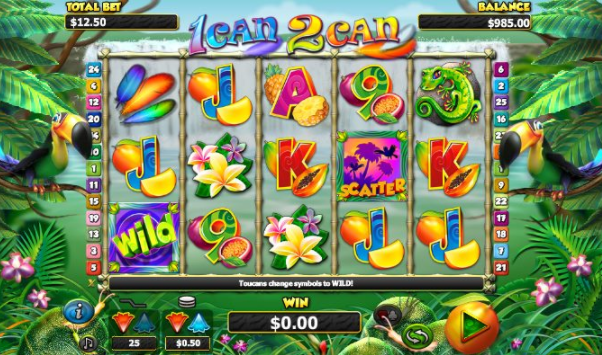 This jungle themed fruit machine play slots online 5 reel, is perfect if you’re interested in a quirky rainforest adventure. As well as a quirky adventure this game offers some fantastic cash prizes that will leave you flapping away all day long. NextGen Gaming has been around since 1999, and since then they have become an online gaming provider that is powering the future of the industry. Using the latest technology and gameplay innovation, the latest graphics and animations which are regularly updated, NextGen has established itself as a premium software provider. Always one to seek out the newest gameplay elements in online slot gaming, NextGen also seeks to ensure that the players get the most out of their games by providing a more personal experience. To learn more about our EasySlots promotions please click here. Have you ever wanted to take a trip to a beautiful jungle and gorge yourself on the most colourful tropical fruits? Now you can with this vibrant 5 reel, 25 pay line online slot game. Bets start at 1p up to £50 per spin, ensuring that anyone can join in the fun with 1 Can 2 Can online slot. In this tropical paradise lives two Toucans, 1 Can and 2 Can. These colourful and entertaining birds are hungry for some delicious fruits that are hanging from the reels. The lush green vegetation and vibrantly coloured flowers and fruits are set against a backdrop of cascading waterfalls, giving you an instant feel of tranquillity and peace. This is the perfect place to transport yourself for an enjoyable slot game. On the reels, you have traditional card playing value symbols covered in yummy, juicy fruits. Just what the Toucans are looking for. These symbols are plentiful and can reward you between 5 and 100 times your stake. You also have some colourful Feathers, and if you find 5 of these symbols the Toucans will reward you with 125 times your bet, as will finding 5 Flowers. If you can find some of the Toucan’s missing friends you will receive even greater rewards, 5 Lizards will reward you with 250 times your stake and 5 Monkeys will give you 500 times your stake. Check out our full range of games and play slot games today. 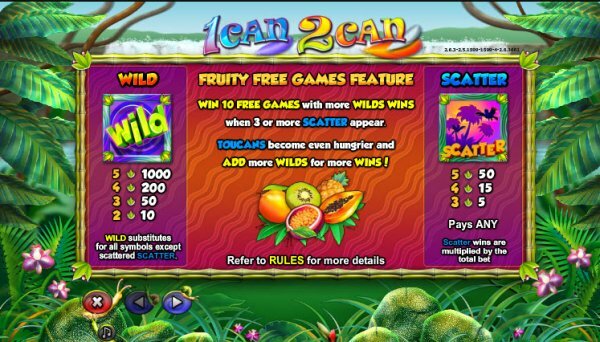 1 Can 2 Can is a highly enjoyable slot, and anyone can get in on the fruity action with the betting range. This will entice Low Rollers to High Rollers. The graphics and animations are beautifully done, they’re crisp, smooth and full of energy. A rather grand game for you to enjoy is here at EasySlots.com.